When your book is signed to a publisher, one of the most delightful aspects is getting an editorial report when you’ve submitted your book draft. Editors know story. I’ve been lucky enough to work with three incredible editors, and each time, it felt like Christmas when I received my feedback report. Part of the reason I loved those structural notes was because I learned so much about storytelling and story structure in the process. What was interesting for me to write, may not have actually helped advanced the story. Similarly, I’d too-quickly summarise a moment or meeting of huge significance to the key point of the story. The key with assessing your manuscript like a professional would, is to question every page and its relevance to the point of your story. This is where your memoir focus sentence really comes in handy. An editorial feedback report is anywhere from 10-30 pages of written feedback on structure, story, sentence syntax, plot, character development and pacing. This doesn’t cover typos and grammar. That comes at the copyediting stage. I give a 10-page report in my pitch-ready package, but I want to teach you how to write your own. Read on for my guide to editing your manuscript (structurally) like a pro. It will improve your chances of landing a book deal and it will make you a better writer, too. My agent gave me the extra tip of laying out the print version in landscape, two pages to a page, because that’s how it looks in a printed book. This is really helpful because you can see how many pages are in each chapter, when you’re doing excessively-long paragraphs or including no dialogue for pages at a time, and as a whole, where you’ve placed key events in the narrative. If they’re all up the front of the book – why would anyone keep reading? 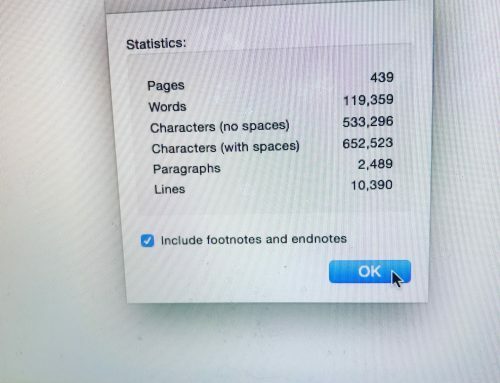 Aside from being incredibly helpful from an editing perspective, it also meant that when my final draft was submitted – I had over 600 A4 pages lying in a stack next to my desk. As a Virgo moon who likes to recycle (! ), I couldn’t help but chop up the pages for daily to-do lists. Only problem is, sometimes I find myself examining the sentence structure of certain early drafts of random pages and gasping at how bad it was. 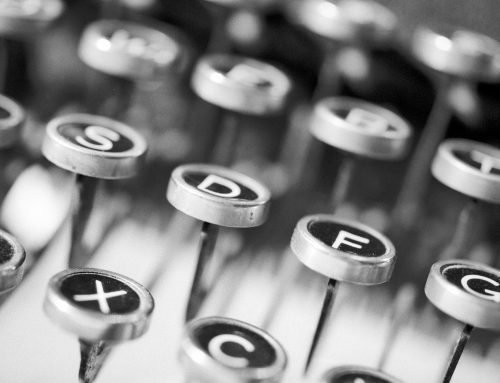 Bottom line: re-writing and editing will make your manuscript sing. Don’t you dare send that draft to anyone before you’ve given it another go! Give yourself an undisturbed 3-5 hours to go through the manuscript (it takes a LOT of focus). Start a document on your computer and keep a stack of post-its handy for bullet point notes you can stick on the actual pages. Then, when you work sequentially through the manuscript in your re-draft, you’ve got all your guidance ready to go. Remember that your manuscript is a story, first and foremost. If you were telling an important story to a friend, would you explain everything that happened in your life before a bear came to eat you? No. Maybe you’d include why you happened to be in a particular location where a bear was (ie. relevant info) but it would all tie into how and why a bear came to eat you. Similarly, when you’re looking at your manuscript, examine everything to assess whether the event or explanation in every one of your laid-out chapters relates to the key action or point of the story. If not, it will need to go. “Because it happened in that order” is the worst reason to include something in your memoir manuscript. If it makes more sense to put the most crucial scene up the front (even if it happened at the end of the story), then do so. You can turn it into a flashback, or play with the narrative. TIP: when your manuscript is laid out on the floor, how many pages does it take for you to get to the ‘point’ of your story, or the reason you are telling this story? Can you move some of the back-story scenes (only if they’re necessary for the reader to fully understand the story) to later on in the book? This will help with pacing. Remember that the first ten pages are crucial in hooking the reader. Here’s a truth: you can make anything boring. How? By including too many irrelevant details. When I look at early drafts of A Letter From Paris or Love + Other U-Turns – or most of the manuscripts I’ve worked on for others, there is so much detail that the really interesting information is drowned out in tedium. 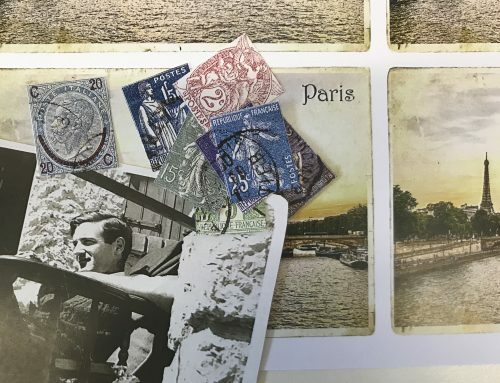 For example, in one of the early drafts of A Letter From Paris, I described in (excruciating detail) what I wore and what I ate for dinner the day I received Coralie’s email from Paris. How was that relevant to the story? It wasn’t. So I cut it. STILL – getting that first draft info down is crucial because, as Terry Pratchett so wisely said, you need to tell yourself the story before you can start to edit it. By including excessive detail, you make the reader work harder to understand where you’re taking them on the journey, and why they should keep reading. Anything that doesn’t advance the action of the story needs to be eliminated. This ties into what I said above – just because something happened, doesn’t mean you have to include it in your memoir. Memoir is a story. It’s not your diary. For example, if your story is about a battle with depression, why do you have three chapters devoted to an epic and delightful trip you went on to Zimbabwe? Unless that trip contributed to your depression or led to an epiphany (or recovery) from said depression, it needs to go. The opposite goes for elements of the story you’ve skipped or skimmed, which are actually crucial to the plot. This can be a bit trickier to assess, when it’s your own story. But if you keep referring back to your focus sentence, you can make some good judgement calls. For example: If we’re to stay with the depression memoir, and you’ve only written a sentence to a paragraph about your first experience of meeting a psychiatrist to deal with the issue (a crucial ‘turning point’ in the story’), that will need to be ‘padded out’ and turned into a scene or a chapter. Chapter 4 – add more re: first visit to Doctor. Add dialogue (check emails from June?) Cut trip to park. Book-length work is all about scene-setting. You have the luxury of a longer time to set the scene, so this is when your creativity can really come into play, even though you’re telling a true story. Examine your manuscript for excessively simple ‘telling’, not showing, and note where you could expand and really pull the reader in further through setting the scene with metaphor. For example – do you repeat a sentence such as “I was exhausted” a lot? How could you show this, instead? Did you drive home one night only to realise you couldn’t remember the trip home? A great example of showing, not telling, is in Cheryl Strayed’s WILD, which I explore in Secrets of Bestselling Memoirs. She could easily have said she was sore from hiking, but instead used the example of taking a bath and seeing herself for the first time in a mirror, to ‘show’ her physical condition. TIP: Use your laid out draft and look at each chapter, writing a one sentence summary of how the actions of that chapter advance the story to the end-point or conclusion of your memoir. Where do you need to set the scene better? Ideally each chapter starts with some scene-setting. Can you look at a diary, some photos, an email, to get more details around a particular bit to fill out the scene? Use your memoir focus sentence to assess each chapter for relevancy to the story as a whole. If the action of each chapter advances that key point, keep it. If not, cut it. If certain aspects need expanding, note that, too. Cover each chapter in post-its with bullet point notes if you need to. Transcribe your post-it notes into a word document you can work through sequentially (this is your own editorial report!). Part of the reason re-drafting can be so overwhelming is because we don’t know where to begin. 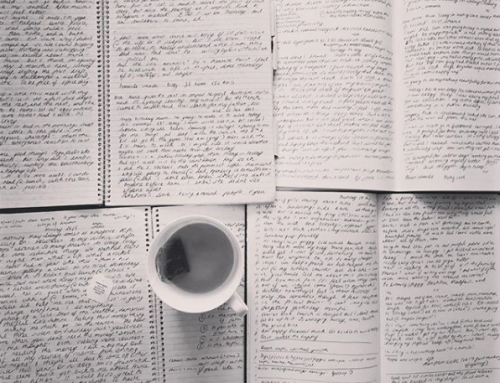 By creating your own editing notes, you’re making your own guidebook, really. 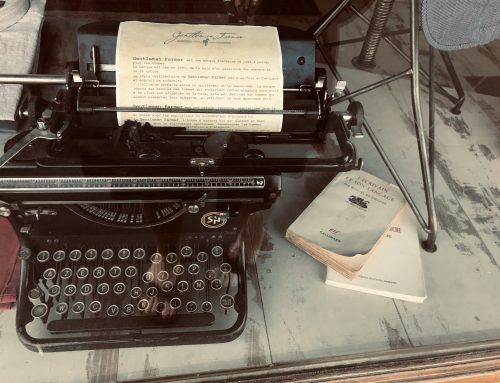 One last thing: If you’re hoping to pitch your manuscript to a publisher or agent, the first twenty pages need to plunge the reader into the story. They need to hint at the ‘adventure’ to come and even the conclusion or end-point. This is a little taster of my upcoming Plan Your Memoir course which is all about teaching you professional techniques to plan, draft, revise and prepare your manuscript for publication. Make sure you’re signed up to my mailing list to get the scoop on early enrolment discounts! Wish my mind was so orderly. Can ‘see, you’ve written a few books and know the drill. Thanks for the info, you explain it so well and helps us wannabe’s. Very sound advice. I will be using your guidelines with my next book. Glad it helps! I find the visual map out (on floor or board) really helps get the overwhelm out of your head and you can see the ‘big picture’ of your story, if you will. I had the chapters in some sort of order, I hoped. Then I was overwhelmed as to what to do now. I walked away from it. Tonight I find your advice on editing a manuscript! Lo and behold, a PLAN! I knew a lot was going to be cut, but your advice told me how to weed it out. Thank you again! Your expert advice and encouragement is much appreciated! Working on my second book, this one a memoir, and i’m at the beginning so will be able to utilise your advice from the beginning!! That’s wonderful feedback, so glad! etc. My memoir however is about a journey I took decades ago, and I have long lost any contact with the other two people who came with me. If either of them disliked what I wrote (not that I intend to offend them, but you never know) how could I deal with it? Could they stop it being published? Would it help to write a disclaimer saying this is only the author’s interpretation of the events? 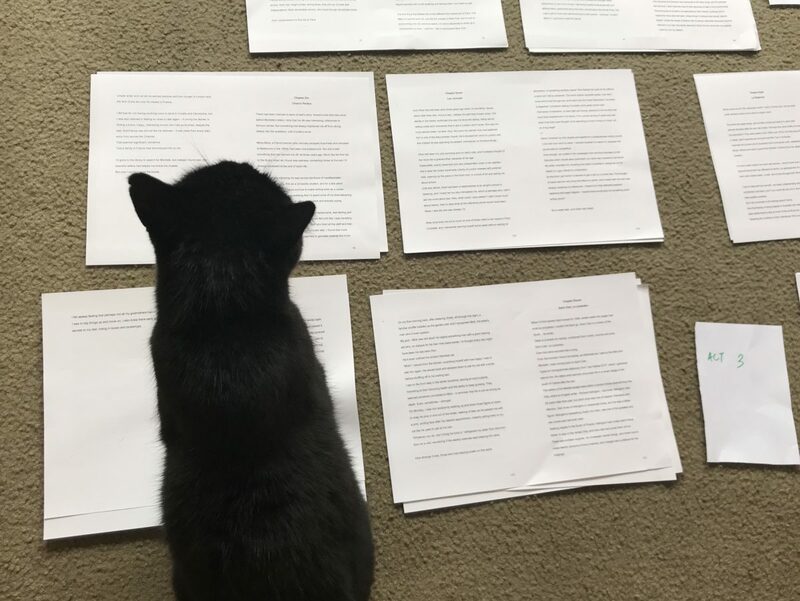 The other thing that interests me is how you keep your cats from sitting on your first draft when you lay it out on the floor! There are many memoirs written years after the fact. Memoir isn’t a legal document – used for a court case – so no, unless you were openly defaming your friends, which i doubt you will be, your book can’t be stopped by someone’s opinion! The other thing is that memoir is your subjective experience of something that happened. Marred by memory, by your human fallibility, by your perceptions… WILD by Cheryl Strayed was written years after she actually did that hike. In terms of dealing with other people’s feelings, have you read the post I wrote on “what will people think?” – I’m also going to cover this in the videos I’m posting this weekend about the basics of memoir. And nope, never could keep sabrina from walking all over my draft on the floor!